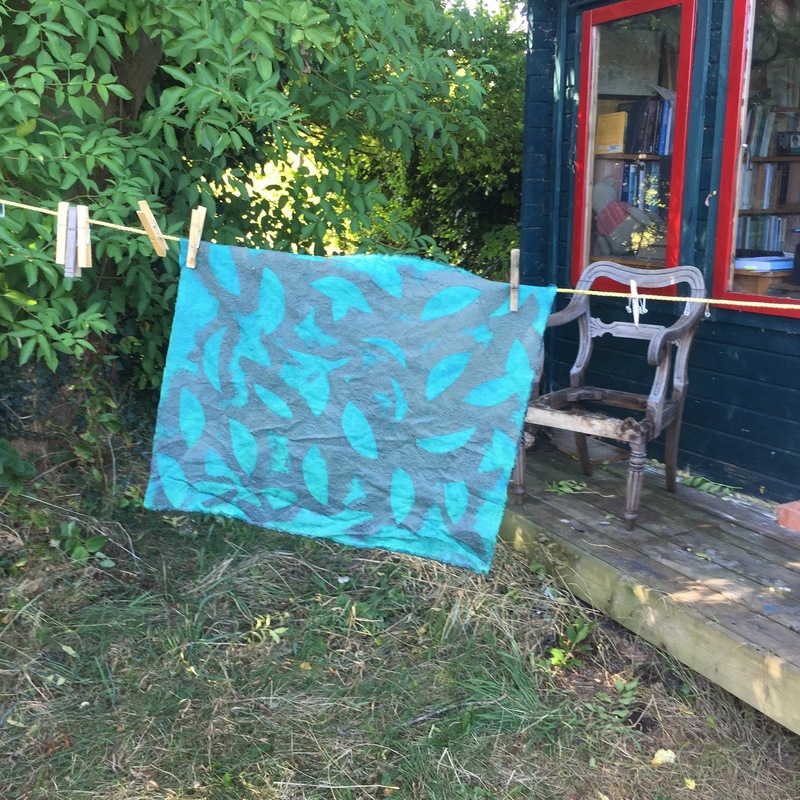 I had a great day this week printing lengths of my hand-dyed cloth in the factory - these will all be sewn up into lovely cushions, aprons, teatowels, lavender bags, all sorts...for sale at up and coming Christmas markets at the Downland and Weald Museum and Crafty Fox Market in Peckham. My print day was the culmination of 2 weeks work outside in the garden with metres of heavy, wet cloth soaking and boiling them in wood ash to mordant them (so that the dye stays) and then dipping them into my bubbling caldron of walnut and rhubarb dye. All my fabric is odds and ends recycled from the factory. At Dora Fabrics we are very sustainable! And slow. 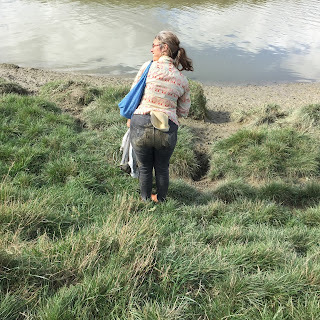 I then had to do masses of ironing before loading the fabric onto my bike and heading down the cycle track to Shoreham and the London train. Once I got me and my fabric to Ivo Printing factory in Southall, all the lengths had to be pinned out on our lovely long printing table - 50m!! This very time-consuming so next time I will sew them together first. The screens were them squared (so they don't print crooked! ), the repeat set and the colour checked. My walnut dye had come up darker than last time so Andy our colour matcher adjusted my mustard colour - brought it up so that it had more oomph. Shelley and Monique then got on with printing the lengths although it was a bit of a pain to wash up so many time (sorry girls and thank you Dave). They did a great job and I was very happy. Washing up the screens is one of the wettest and coldest jobs in the factory. I then sewed up the printed fabric so that it could be baked in the huge baker at the end of the flatbed machine. This is a truly terrifying moment as all my precious fabric disappears into this the massive boiling rollers... then appears again. Material does get lost and Podge has to climb inside and fish it out - scary!! Finally, the material gets inspected to spot any print flaws - Rob passed my print. Thank you Rob! Now I cycle with the fabric to Beverley who will transform it into beautiful things. 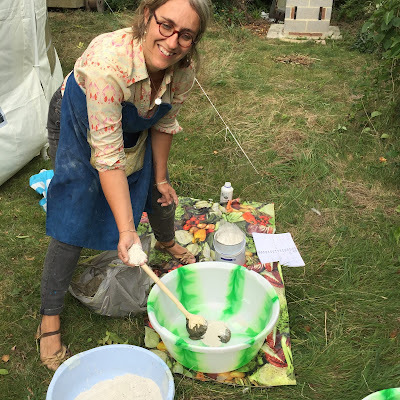 Sally and Geoff kindly lent us and even erected their party tent in our garden (very bake off) and we got started by foraging and collecting local plants, leaves, bark, mud, chalk... everything we might need for making colour, creating resists and dyeing cloth. Together we filled our huge collection of pots and pans (sorry, Ursula but the seaweed went in the one you leant me) with our seasonal haul - hops, alder, ash, walnuts, willow, black berries, wayfarer tree, weld, dandelions, rhubarb, raspberry leaves amongst other things. And as we got the colours on the boil, delicious smells and enticing colours started ouzing out. At this point we short circuited the electricity in David's writing hut - but redeployed our stoves and kept ongoing. We also mixed up a resist in the tradition of Indian dhabu printing using mud from our local River Adur and smashing up loads of chalk - which was hard work. We dyed our resists in indigo with lovely results. By the afternoon of the second day we were totally on a roll - I was very impressed by everyone's meticulous record-keeping of their experiments with different mordants and afterbaths. Very different colour palettes emerged. It was to be to be honest - a bit of an adventure... climbing chalk cliffs, slipping in mud, getting stung and ruining our hands our hands in the process - but the results were truly stunning. 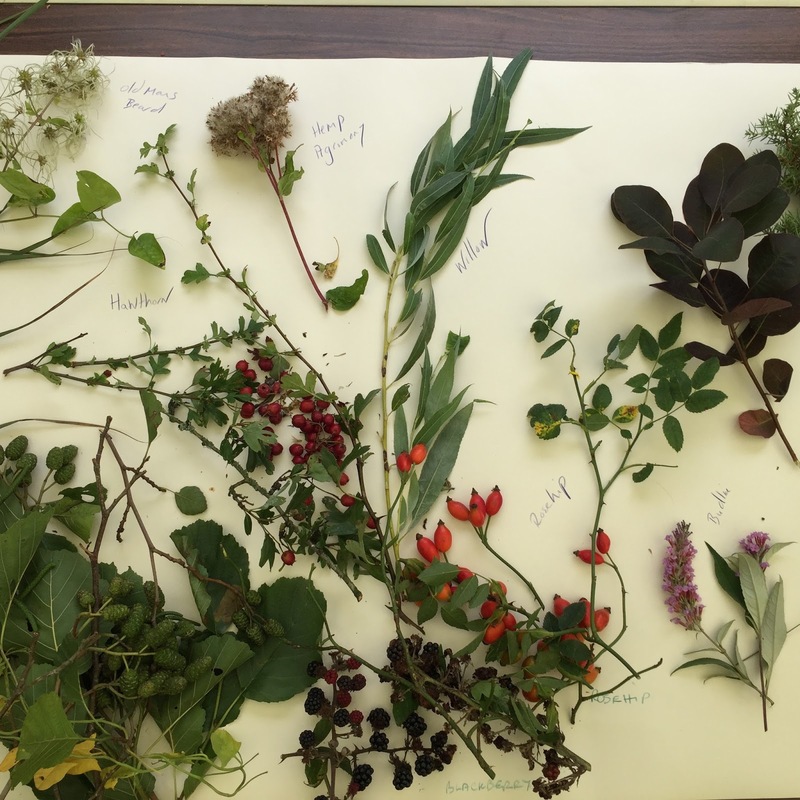 We were overwhelmed with the range and breadth of colour that can be created locally and on such a low-tech basis. Well done to everyone who came along and shared their energy, passion and enthusiasm. Especially Elise, who helped so much - thank you. 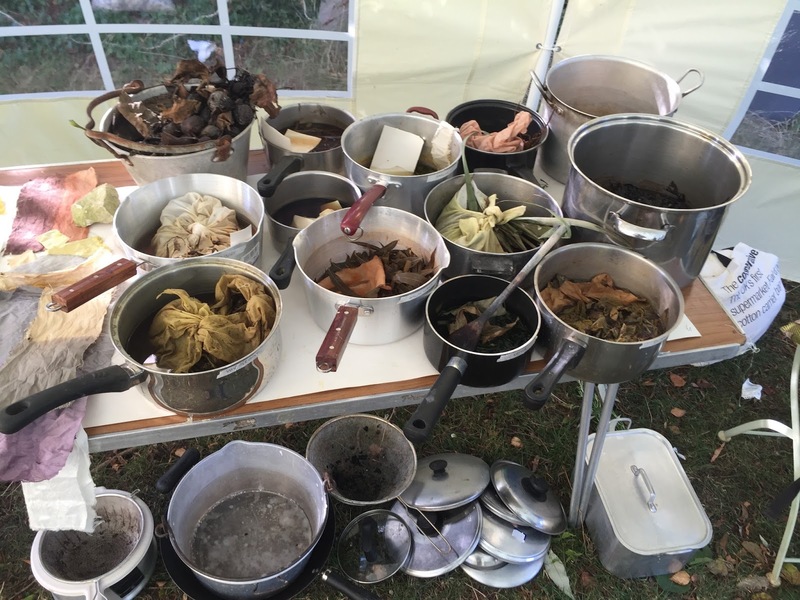 The workshop costs £80 for 2 days with all materials included and you will learn how to make your own natural dyes using foraged plants, make mud resist patterns with indigo and experiment with a larger piece to take home with you. 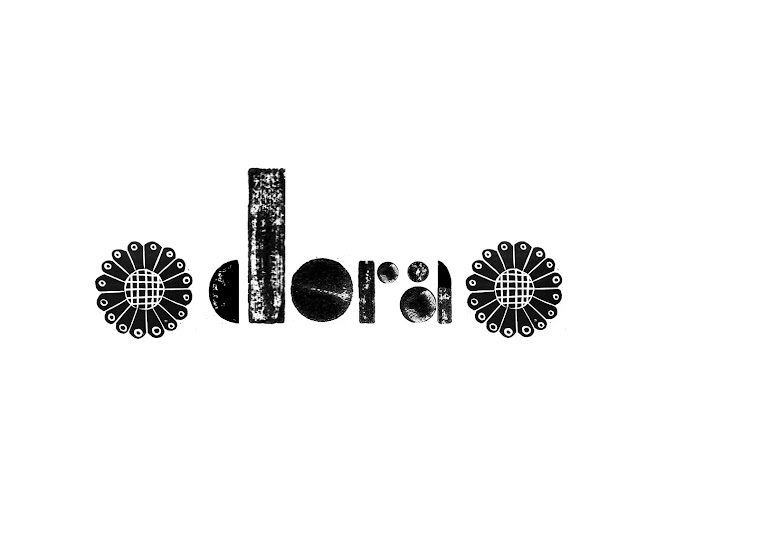 My website www.dorafabrics.com finally went live this summer and I wanted to blog about the whole experience of creating the website, products, logo. First and biggest thanks to Andy Hodge who encouraged me from the first and did all the technical stuff so that I can now manage and maintain the site for myself. Building the website was great for helping build a team around me - Beverley Witter at Opening Statement who sewed up the blinds and cushions, Martin Cleave who took the beautiful photos as well as Andy throughout. I dyed, printed and sewed everything else myself, including metres and metres of wallpaper...sometimes it felt like my degree show all over again. Martin took my idea (above) and turned it into this! Have a clear vision for your brand - with a little help from my kids I got there in the end. Robin told me 'Not everyone wants everything indigo, mummy' - a real breakthrough moment! Be organised - with a clear list of products and shots needed. Martin only had a day to do the shoot so we had to be super organised. Ask for help - Fanny Shorter (www.fannyshorter.com) helped me with legal blurb and terms and conditions. Thanks so much Fanny! Please have a look and let me know what you think. It's definitely still a work in progress - but for the moment it's helped me create a public face for dora fabrics that I can share with the world and take advantage of many more opportunities (apply for markets, commissions, promote my workshops etc) as well as connect with potential customers. Whilst I have been designing and printing my own designs for a while - this is the first time I have had a design produced commercially and it's been an exhilarating rollercoaster of a ride. It all began months ago when Virginia wanted something lacey - I went away, rummaged in my lace collection and started work on a woodblock design based on a piece of antique french lace. Amelia in the Ivo design studio then helped me transfer my print onto a large screen, advised by factory manager and general print genius Podge and produced by screen maker extraordinaire Chris. When it came to sampling the new design - basically exploring the best colours, scale and materials to print on - I worked with Monique and Jo on the hand-table, and then Chris and Ian took over to print show lengths on their galli machines. Virginia's bold use of colour was sometimes a bit of a challenge for me, as she often told me she didn't want anything crafty looking, but this was great as it shifted me out of my comfort zone. The whole process, taking many months - has been a real team effort and opened my eyes to the reality of designing and making - which always involves drawing heavily on the expertise and knowledge of others rather than sitting designing on your own in a little bubble. 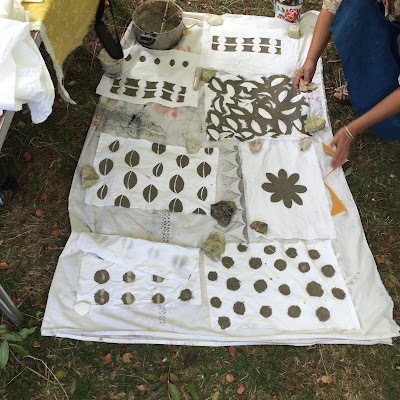 The experience has also brought together my two different worlds - working as a handprinter at the wonderful Ivos screen printing factory and producing my own designs. It's helped me to understand the pressures of commercial production but most of all it's made me realise how lucky I am to be part of such a great team! Thank you everyone at Ivo's and Virginia for your support. Barron and Larcher - back to life! 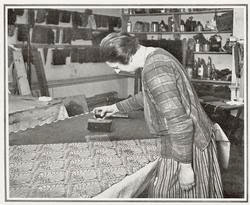 This week I have been lucky enough to be sampling my heroes of 1930's block-printing - Phyllis Barron and Dorothy Larcher. 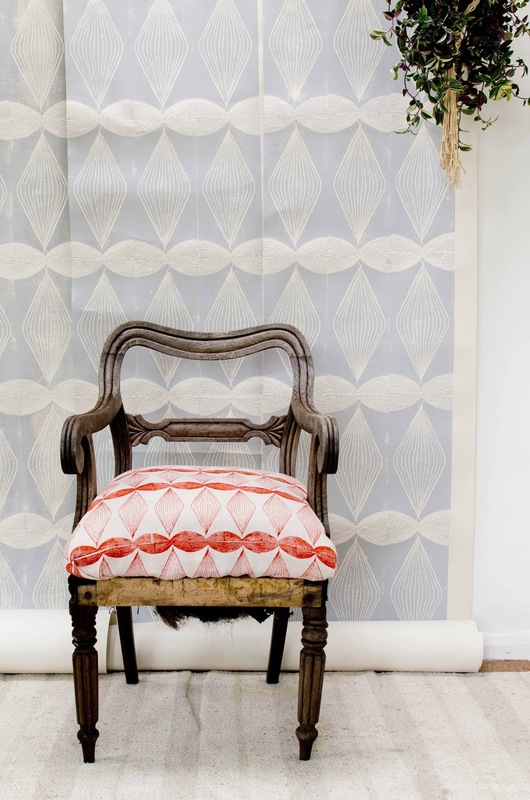 The visionary Michal Silver at Christopher Farr Cloth is reviving their archive in partnership with the wonderful Craft Study Centre at the University of the Arts, Farnham - and we are lucky enough to be sampling the designs at Ivo Print. It's been an emotional experience to be printing their designs myself after so many years of tracking their fabrics down in dusty archives…Let's hope they now get the recognition they richly deserve. of shape and line and contour with colour. 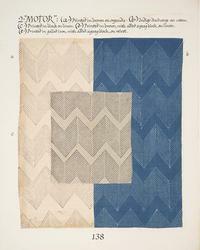 Vorticism, with an emphasis on movement through image and its abstraction on cloth. 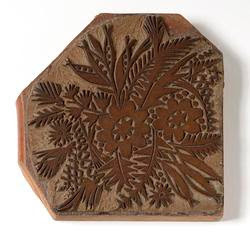 For me the magic of their designs lies in the harmony and beauty of their mark-making (they cut their many hundreds of blocks by hand) and their sense of colour - drawn from earthy natural dyes - like iron, rust and gall nuts as well as indigo which are given the occasional punch with citrus lemons and bright reds. 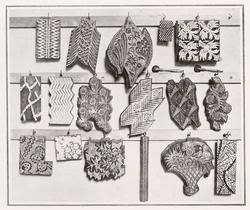 Barron and Larcher were alive to all the subtle possibilities that the printing process offered and in this sense were true pioneers of cloth. Together with Michal and the team at Ivo's we are trying to stay true to their original vision - with sensitive contemporary translations that we hope will bring their wonderful work to a new and wider audience. We are so grateful to Jean Vacher and her husband from Craft Study Centre, who dropped by the factory with a box of original Barron and Larcher cuttings! Do have a look at their online archive - www.vads.ac.uk if you can - it's truly inspiring.